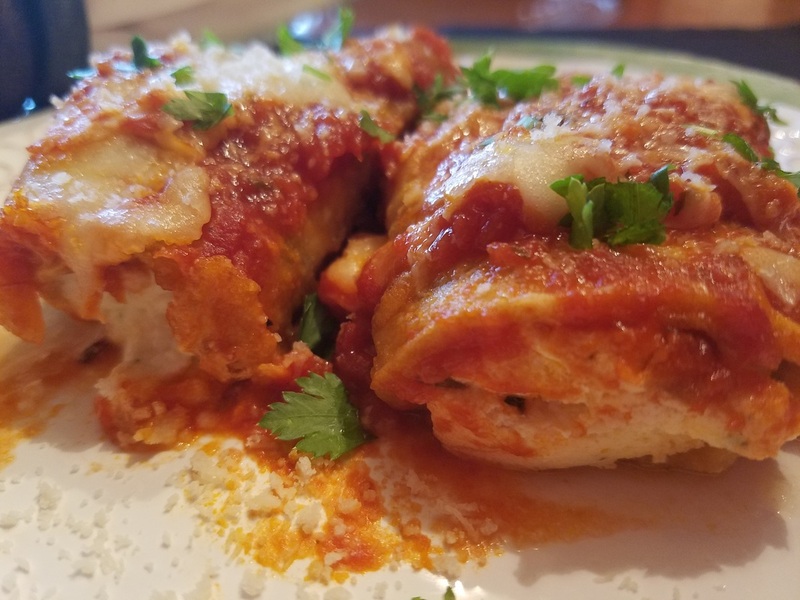 A delicious roll of eggplant, ricotta cheese, mozzarella cheese, all smothered in sauce.......it's definitely all good stuff!!! I know someone who makes .....hands down......the very best Eggplant Rollatini in the country!! Yes Mary....that is you. I could probably never compare but I will do my best until someday you share all your secrets with us. I like to use a mandolin slicer for this one. It makes the most perfect. thin slices. If you do not have one, you can cut the slices yourself. Just try to make them super thin. Heat oil in a frying pan. Dredge them through the flour first, then dip and coat well in the egg. Fry for only a couple minutes on each side until golden brown. Preheat oven to 350 degrees. In a bowl, mix the ricotta cheese, mozzarella cheese. grated pecorino romano, parsley and pepper. Place about 2 Tblsp of the cheese filling in the middle of a slice of eggplant. Now just roll up and place in a baking dish already prepared with some sauce on the bottom. Continue rolling them all up and place in the baking dish. Top with sauce and some grated pecorino romano cheese. I threw on a handful of mozzarella also. Bake at 350 degrees for 40 minutes. I hope you enjoy my Eggplant Rollatini until I can get all of Mary's secrets out of her!! !